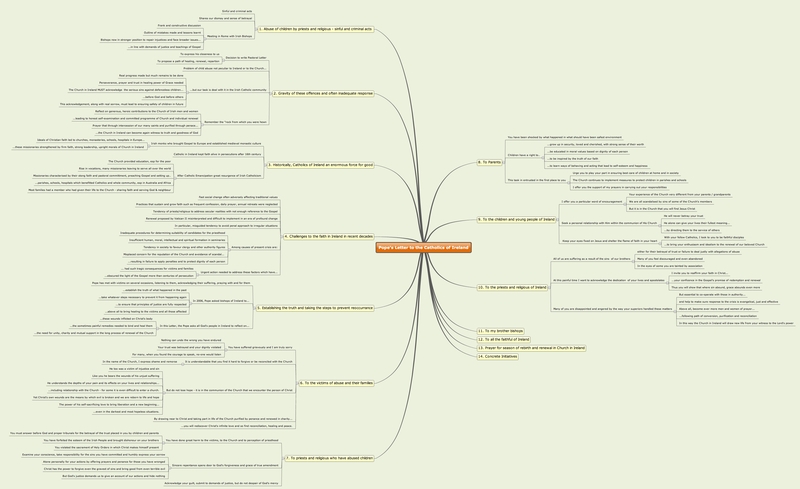 • Pope’s Letter to Ireland: Mindmap (Work Still in Progress…) | Is The Pope a Catholic? Thanks for this, Petra, I’m going to print the map off and use it to clarify points to my friends..thanks for making it a bit easier!! You might like to hold off on printing it til I’ve got it finished – and I’ll be including a link then that allows you to adjust the levels visible on the map e.g. so that only the chapter heading are visible etc. Wow that is brilliant Petra. It must have taken you ages. I am thinking of using mindmaps to recall my law cases for exams. I have the software but it seems complicated:-) I see Robert, over on Faith and Life, is using cloud tags.